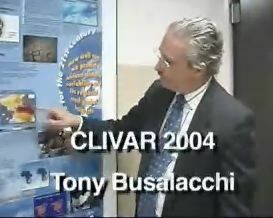 Tony Busalacchi, Co-chair of the CLIVAR Scientific Steering Group discusses the aims of the CLIVAR 2004 Conference. **Note: Real Player needed to view this video. For a free download, go to www.real.com for a free player. The 1st International Climate Variability and Predictability (CLIVAR) Science Conference will bring together over 500 climate researchers from 56 countries who are contributing answers to fundamental questions on the variability of the climate system and how we can better predict future changes. Answers to these questions require we observe and understand the interplay between the global oceans and atmosphere, as well as characterize the role of the land-surface conditions which can act as a source of moisture to the atmosphere. CLIVAR's focus is on natural variability and increasing our ability to predict the future of the climate system (how does the climate system of the earth work? how is it changing? can we predict future changes and if so, how might this impact our world?). El Niño is just one example (monsoons is another) of a phenomenon of interest to CLIVAR. Research in the 1980's and 1990's resulted in experimental forecasts of El Niño. Today, forecasts of ENSO (the general term referring to anomalous tropical Pacific conditions such as El Niño and La Niña) are routinely produced, but our skills in predicting when and by how much it affects local climate and weather remain a challenge. CLIVAR is not only addressing how to improve ENSO predictions, but is also exploring climate variability over decades and centuries and assessing if these changes are predictable. CLIVAR is also trying to discern how the climate system might be different under conditions of increased green-house gases as well as by different natural "forcings". A series of commissioned and invited presentations will highlight the most relevant and newsworthy current research findings. Our plans for providing a productive opportunity for media representatives are underway. Information on the featured speakers appears on this page. We are planning to provide accommodations for interviews and press conferences; more details will follow shortly. Jana Goldman (Jana.Goldman@noaa.gov ; phone:(301)713-2483) and Kent Laborde (Kent.Laborde@noaa.gov; phone:(202)482-5757) are serving as the points of contact for further information. Please send all press/media inquiries to them. A Press Work Room for media will be in the VIP Suite on the Ballroom Level. The Press Room will be staffed from 8:30 a.m. to 6:00 p.m., except on June 25, when it will close at 1:00 p.m. Below is a schedule of daily press briefings. All briefings will be held in the Press Briefing Room (Room 330) one floor below the Press Work Room.